Julie Hochstadter, a 35 year-old realtor and bike activist, bought her first car when she was in college. “I was driving around Chicago all the time. I was always inside my car,” she said. Seven years ago, a trip to Israel made her rethink her everyday commuting. She participated in a five-day bike ride that promoted healthier and more sustainable communities.She loved the experience so much that as soon as she got back home, she bought a road bike and decided it would be her main form of transportation. She got so enthusiastic about cycling that she is now the director of The Chainlink, an online community that promotes bicycling in Chicago. Julie is not alone in her journey. 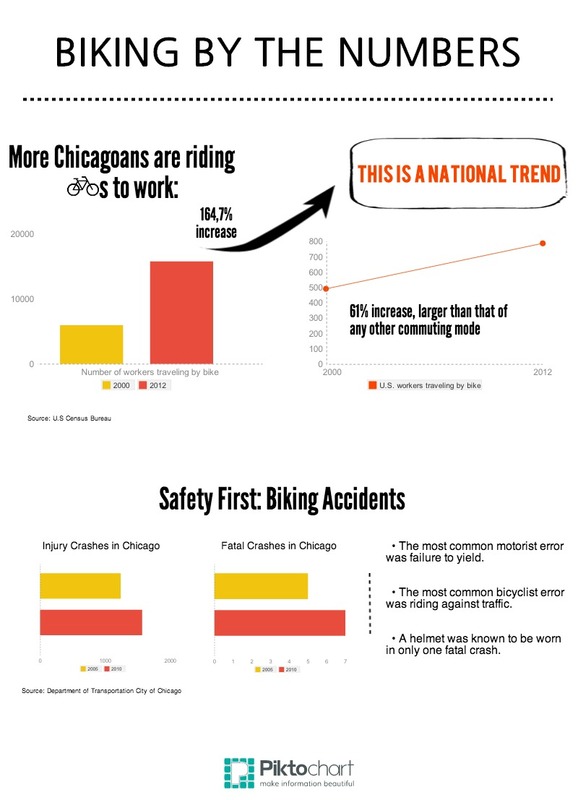 Between 2000 and 2012, the number of Chicagoans biking to work increased by 164 percent from 5,960 to 15,780 , according to the U.S. Census Bureau. This number tends to increase as the city expands its biking infrastructure. Today, Chicago offers 200 miles of on-street bikeways, 12 miles of which are protected. The Chicago Cycling Plan 2020 aims to have 100 miles of protected lanes by 2015 and an additional 50 by 2020. Click to enlarge. Graphic by Raquel Salgado. Mitch Salm, a 27-year-old actor who has never owned a car, exemplifies this bike-friendly generation. “Biking makes me see the city from another perspective,” he said. Salm estimates he rides about 70 to 100 miles every week. Swapping cars for bikes is a trend that is not unique to Chicago. U.S. Census Bureau data shows biking has experienced the most growth among modes of commuting nationwide. The number of American workers who ride their bikes everyday to work has risen from 488,000 in 2000 to 786,000 in 2012 — a 61 percent increase. A combination of personal motivation and government initiatives have contributed to the rise of cycling in the U.S. and in Chicago. Traffic congestion has played a role in some people converting. In 2000, for instance, a Chicagoan lost, on average, 39 hours in a year due to traffic congestion according to the 2012 Urban Mobility Report by INRIX Traffic Data. In 2011, this figure increased to 51 hours. “After getting rid of my car, I realized how much faster and convenient it is to bike,” said Julie Hochstadter, a Chicago bike activist. To many people, her statement might sound surprising. Drivers tend to believe that cars are the most convenient way of getting around a city. After all, you can drive a car anytime you want without having to think ahead about the bus schedule or what outfit you should wear. “Of course you need to plan your trip before you ride your bike,” Hochstadter said. “However, I save a lot of time because I don’t need to look for parking and I don’t stay stuck in traffic.” She said she is always the first one to arrive at meetings, while her friends who drive cars are often running late. In recent years, the number of cities with bicycle sharing programs has increased considerably, according to the U.S. Census Bureau’s Biking and Walking report. “These efforts reflect ongoing changes in infrastructure and travel options across the nation’s dynamic transportation systems,” the report said. Such changes influence decisions people make about their trip to work, according to the U.S. Census Bureau. People for Bike, a bicycling organization, said that 30 cities in the U.S. have bike sharing systems, involving 17,000 bicycles and 1,700 stations. 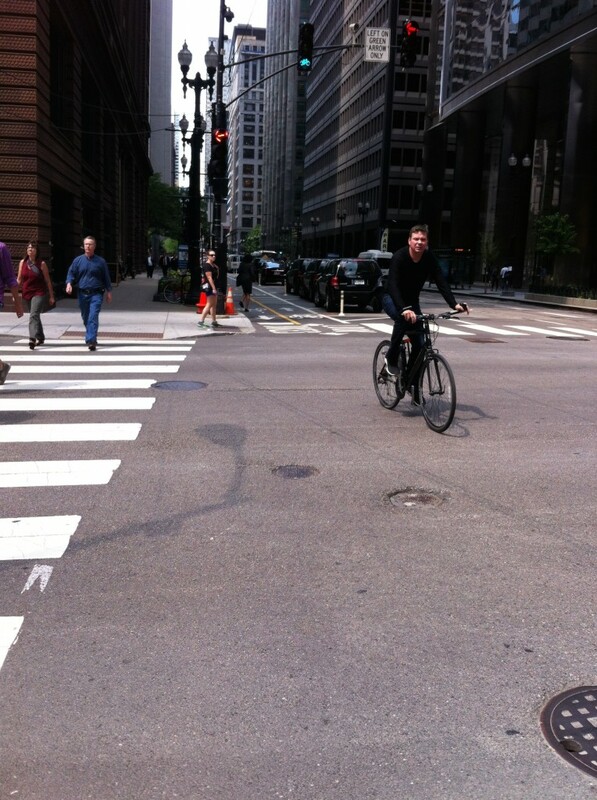 Chicago is an example of a city investing in cycling infrastructure. “Mayor [Richard M.] Daley and now Rahm Emanuel have given high priority to accommodating bike usage throughout the city,” said Schlickman. 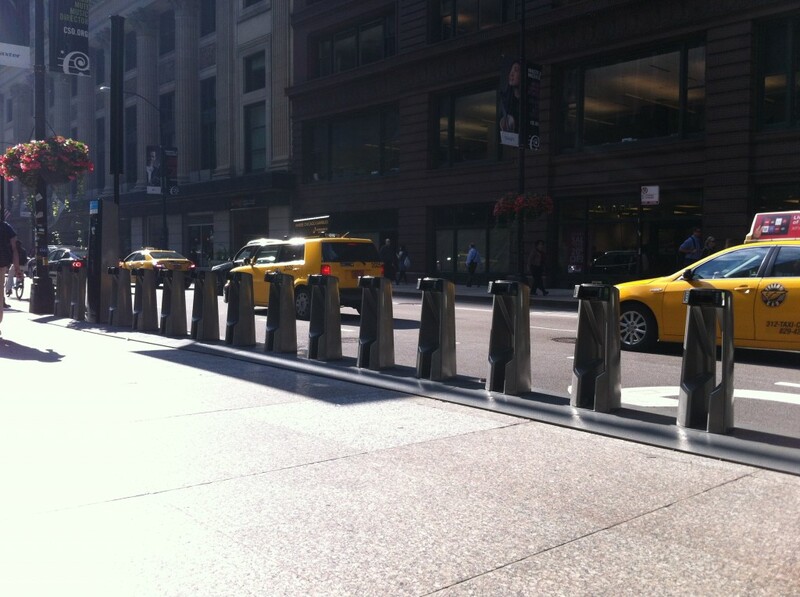 Last year, the city launched Divvy, its first bike-sharing system. The initiative has already attracted 23,000 annual subscribers. For Hochstadter, the city has been doing a good job at promoting biking, but there is still much to be done. One important thing would be allowing more bikes on public transportation. “It’s possible to put your bike in any bus, but the same does not happen on the trains and the Metra,” she said. Bikes are not permitted during rush hours. In Schlickman’s opinion, Chicago could be even more bike friendly if the city administration continues to expand the Divvy system, spreading bike stations in areas further downtown, and improves traffic enforcement for drivers, bicyclists and even pedestrians. “People must be more aware of the fact that they share roads not only with cars, but with all kinds of transportation,” Schlickman said. Find people who are already commuting to work and ride together. You’ll feel safer and more excited about cycling. Don’t want to be sweaty? Think about taking a shower after you ride. Maybe you can register at a gym near your office or ask your company to install a shower. Pack what you need the day before so you won’t be late. You must ride four feet away from parked cars. If you need to avoid an object, you may temporarily take a whole lane of traffic. This is where the most crashes occur. Try to stay out of drivers’ blind spots and always make eye contact. Use your bell and lights to make yourself noticeable.